Happy Friday, Friends! 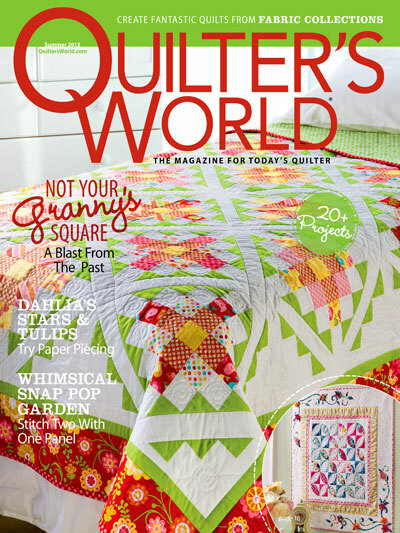 I was going go share with you a magazine feature quilt, but I am going to bump that for next week… because I have BIG and EXCITING news to share! 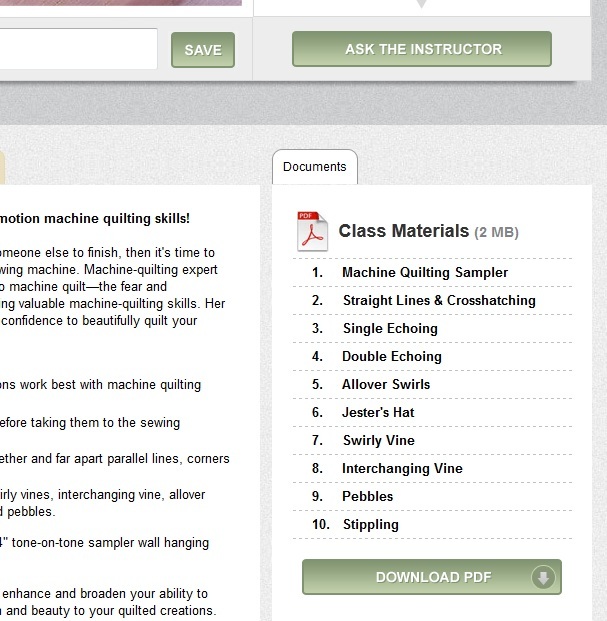 Annie’s is debuting my online Learn to Machine Quilt class!! Click here to view the free preview clips. This has been a massive effort contributed by different people at Annie’s over the course of many many months. I know for a fact that they have worked hard on this. Kudos and a huge THANK YOU to the staff at Annie’s in making the class happen! 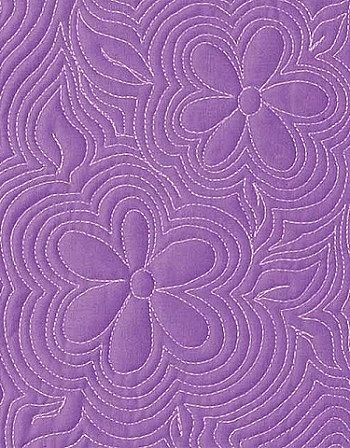 In the class, I will be stitching along with students different motifs on a 24″ x 24″ wall hanging shown below. These motifs are specially selected to help “baby” beginning machine quilters gain confidence in quilting their own quilts. 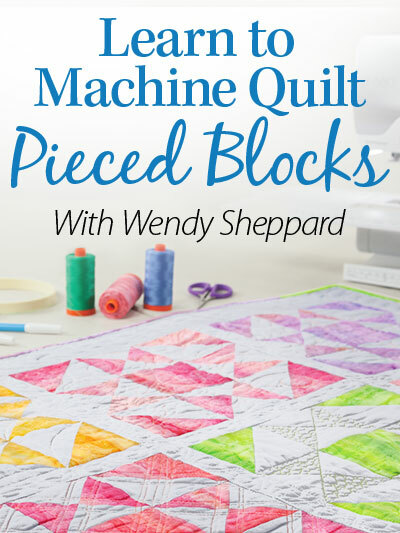 I have tried to keep the class layout simple — with no huge demands on notions or skills to start — just so that you can sort of jump right into this quilting adventure without too much trouble or prep work, and hopefully discover the joy in machine quilting. You will be able to see the individual motifs better in the following close-up images. I will tell you a secret – the images you see are actually the back of the quilt for a better contrast! You can view more motifs close-up by clicking here. 4. There will be downloadable instructions and schematics exclusive to this class. Let me just say some of the schematics done by the editing staff look quite awesome and make my engineering senses all tingly! 5. This class is 100% online. You will get everything pertinent to the class online. So, no wait on shipping etc. For my international friends, the class can be purchased from anywhere in the world! 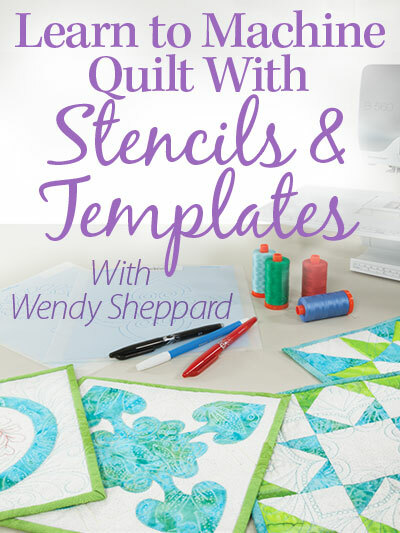 I would be so honored if you would let me play a (small) part in your machine quilting journey and adventure by signing up for the class. The main focus of this class is to help beginners to master the art of moving their quilt sandwiches through the different stitching motifs that can be used later for quilting their own quilts. Now, this class might not be for you if you are beyond the rudimentary stage, but I hope you will tell all your friends about it if they are just starting out, or thinking about starting out in machine quilting… because I sure hope I will be asked to do a feather class for you feather fanatics out there in the near future! 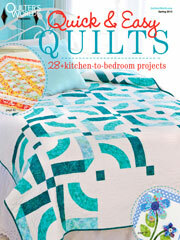 Come back Monday for the behind-the-scenes and personal anecdotes of this rather new adventure in my quilting life! I will also have a surprise for you!!! p.s. 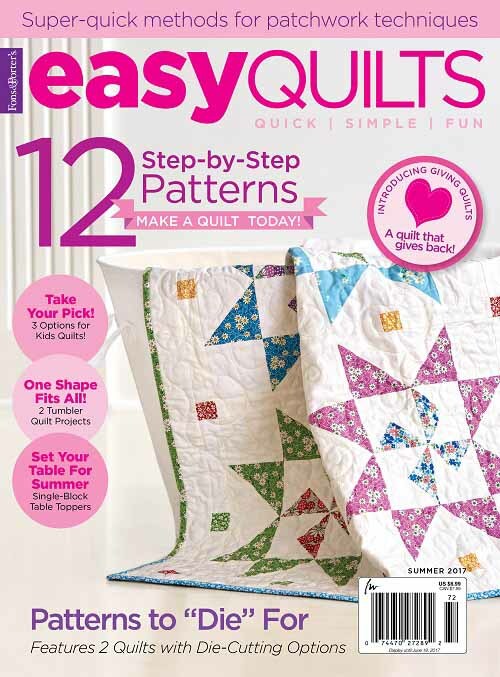 Annie’s also has a story on my quilting journey in their “Meet the Instructor” section. Click here to read if you are interested. This entry was posted in Quilting and tagged Annie's Online Quilting Class, Learn to Machine Quilt, Machine Quilting Class with Wendy Sheppard, Online Quilting Class. Bookmark the permalink. I told you that you were going to be FAMOUS Congrats I am so happy for you and this sounds very interesting. You go girl…. Hugs and lots of luck in all your ventures. This is wonderful news. Looks like a great class and very reasonable price too. I’ll share this with the participants in the 2012 FMQ Challenge. Congrats to you!!! It sounds like a wonderful class. I might get it for my daughter for Christmas :) ….dont tell!! Congratulations! I am so excited to take this class. Woohoo!!!! I will be happy to sign up! I sure need FMQ experience and I can’t think of a better instructor! Blessings to you! Wendy, thank you so much for being willing to take on this venture. I can’t believe this happening! I’ve been thinking about taking one of the classes from Craftsy but none of the teachers seemed to suit what I was looking for. Last week,I was trying to decide which to take! I’m still perfecting my FM but have surprised a few people that I was trying to teach myself. Something kept telling me, “hold on, these are not right for you”! I can’t think of anyone else I would rather learn from. Wow! Congratulations! What a wonderful accomplishment! yippie, you be wonderful and a great help to many. I will pass this on to a couple of my students who would love to do a class with you too. Praises!!! This is fabulous news my friend! You soooo deserve it! Congratulations! Very, very cool! I like that it is available any time. I’ve toyed with the idea of trying machine quilting — at this point I probably couldn’t begin until next year. But I will definitely keep this in mind. I enjoyed reading your “bio” for the class as well. Wendy, this is so cool! It’s so great that you are sharing your amazing quilting skills (I think you are incredibly talented o:) )! I think: You will be a grat Instructor. I would like to see a feather quilting Kurs, wo I can learn all the different feathers I can do. From beginner to difficult feathers. And also I would like to do a quilting curs, where I can learn to quilt Panels. I often did not know how to quilt them. When i then see the different panels in the cours, an evrybody quilt it different I can think I will learn a lot. I hope you can understand my writing. 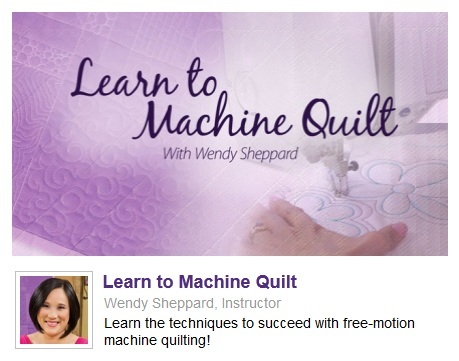 Have so wanted to learn machine quilting but have always been intimidated by the thought of it. I have done only very simple machine quilting on charity quilts. 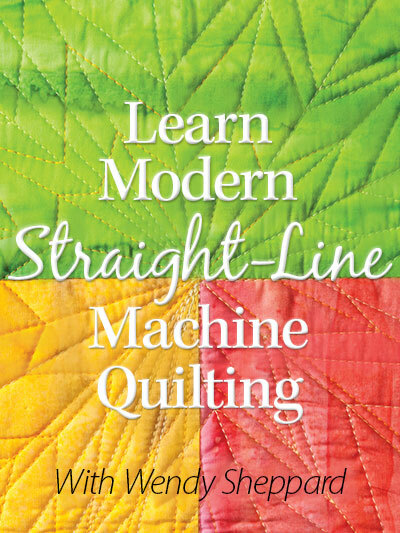 I definitely want to take the above class but first would love to take an extremely simple machine quilting class before tackling it. So happy I stumbled on to your site through Pinterest! Have subscribed to your blog. 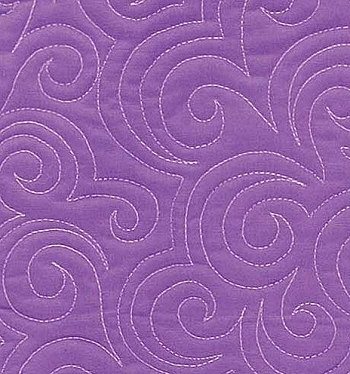 I love reading your blog and seeing the beautiful quilting you do. I also would like to see your presentation of feathers in your teaching classes. 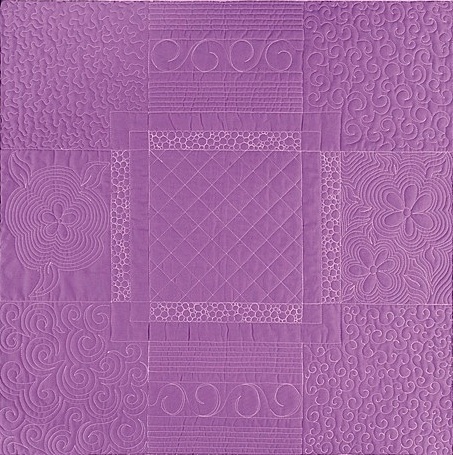 Would like to see more FMQ classes involving simple, large quilt designs to fill the whole quilt.